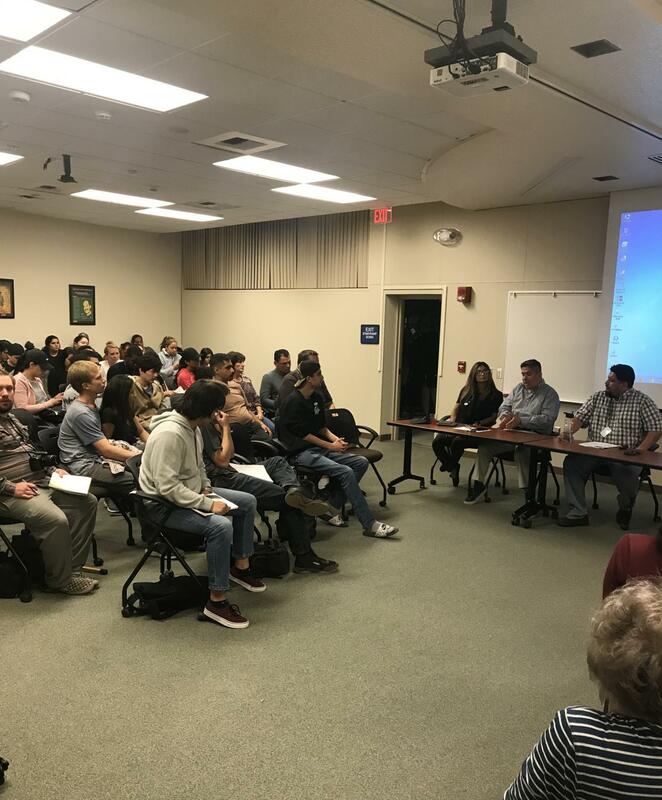 Presented as part of Bakersfield College Veterans Week, The Levan Center hosted a panel discussion, “World War I: A Retrospective,” on Nov. 6 to discuss the importance of the 100th anniversary of World War I and the impact it had on future wars and soldiers. Bakersfield College’s history professors Paul Beckworth, Olivia R. Garcia, F. Javier Llamas, and Tina Mendoza were all part of the discussion and provided insight on underlying details many miss about The Great War. Olivia Garcia explaining “A Reconstruction of Masculinity” to the audience on Nov. 6, 2018 at The Levan Center. Each historian had specific thematic approaches that provided the audience with a vast view on the war. Beckworth, an Army veteran, began the night with overwhelming statistics on how many soldiers died due to the war and the impact of advanced machinery left a devastated loss of men. “Inevitably over 65 million men were mobilized for this total war. Submarines, mustard gas, airplanes, heavy artillery, and the deadliest of all machine guns put death on an industrial scale on the likes of which the world has never seen,” Beckworth said. Ultimately, he informed everyone what happened on the eleventh day on the eleventh month at 11 a.m. The Armistice was signed at 5 a.m., but the war kept going due to the selfishness of the generals leading their men. The fighting continued until the very last second for no good reason. There were over 10,000 casualties on the last day of the war Beckworth explained. 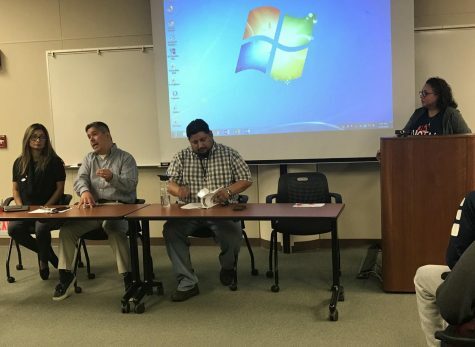 (left to right) History Professors Olivia Garcia, Paul Beckworth, Fransico Llamas, and Tina Mendoza begin the World War I discussion on Nov. 6, 2018 at The Levan Center. Garcia, on the other hand, focused on the gender and social aspects throughout The Great War. She went in depth with the identities of the British soldiers and how propaganda painted a picture of the way a perfect solider should be embodied. 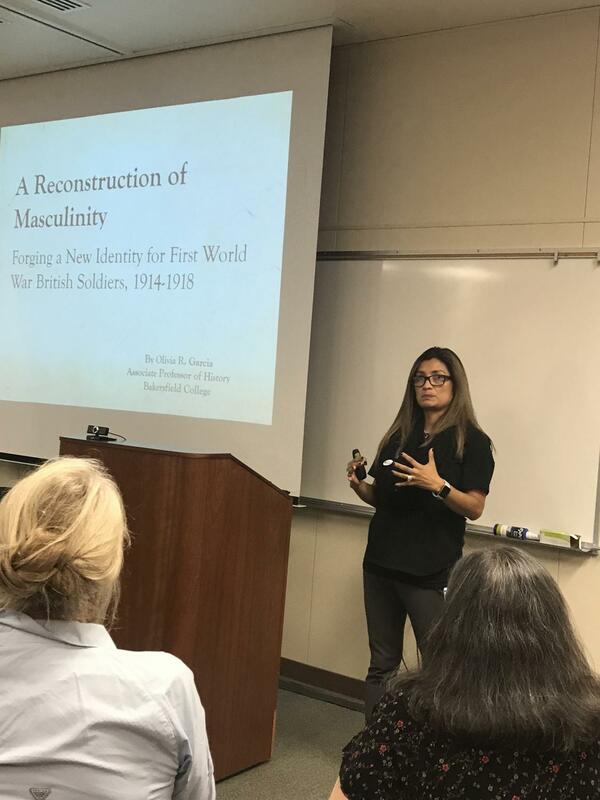 “My talk examines how British educated middle-class soldiers and officers (civilian volunteers) forged a new masculine identity that allowed them to cope with the horrors of war and the absence of home life during World War I,” Garcia said. As a spouse of a military veteran and a mother of two active military sons, Garcia mentioned themes of the heroic soldier, the domestic soldier as in the good son or loyal husband, and the wounded soldier. She also tried to explore ways in which imagined communities created between the soldier and home, such as the relationship and communication between a mother and son, as the solider was away at war. 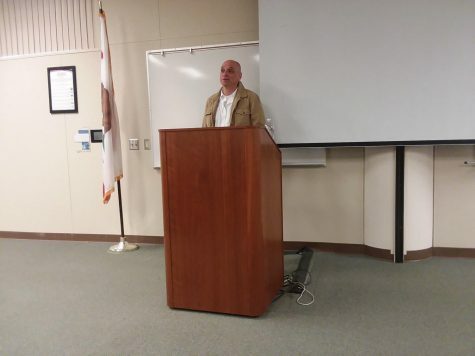 While Beckworth and Garcia discussed the war in the foreign countries, Professor Llamas touched on how the United States handled war issues while staying neutral during the beginning of the war. According to Llamas, the U.S focused on expanding their Naval forces leaving them left unprepared for any type of ground work. 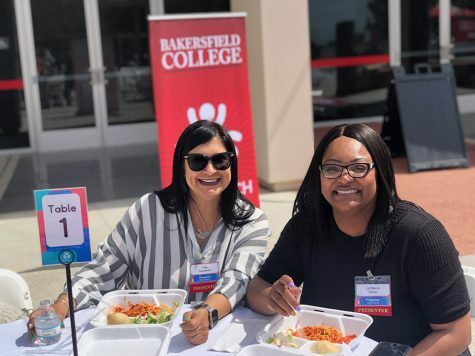 (left to right) Professors Garcia, Beckworth, and Llamas lead the World War I discussion at Bakersfield College the Levan Center. When the U.S joined The Great War, the country was in dire need of soldiers resorting the draft. As the country was still dealing with racism and segregation, the U.S drafted men from all ethnic backgrounds but were treated differently from white men. Llamas went in depth with how World War I shaped the future of wars in American history and the national holiday many commemorate to the fallen men. “Nov. 11, 2018 will be the 100th anniversary of the end World War 1. The rest of the world calls it Armistice Day, but in the U.S it is called Veterans Day,” Llamas said. Attendee Judy Diaz was in attendance and left the discussion well informed about the Great War. “I thought it was an interesting discussion because it educates people about the real reason of why Veterans Day has become a holiday,” Diaz continued.